FedEx Shipping is a premium method that allows you to pull shipping rates via the FedEx API. It requires your store to use US or Canadian Dollars as its currency and your server to have SOAP installed. Please contact your hosting provider for more information on SOAP installation on your server. FedEx works with a base country of United States or Canada and can calculate quotes for domestic and international parcels. The extension primarily works with in (inches) and lbs (pounds), but other units can be converted automatically. The API and the built-in box packer require that your non-virtual products have weights and dimensions set. More info at: Adding Shipping Dimensions to Products. Go to: WooCommerce > Settings > Shipping > FedEx. Debug Mode – Choose whether to enable debugging, which is helpful for troubleshooting purposes. API Settings – Your API access details are obtained from the FedEx website. After signup, get a developer key. After testing, get a production key. FedEx Account Number * – Provided by FedEx after signup. More info at: Open a FedEx Account. Fedex Meter Number * – Provided by FedEx after signup. More info at: How Do I Get a FedEx Meter Number. Web Services Key * – Provided by FedEx after signup. Web Services Password * – Provided by FedEx after signup. Production Key * – Tick this box according to type of account (developer or production). FedEx LTL Freight – Settings for FedEx Freight rates. Tick the Enable Freight box to offer this option and fill out your full shipping address. Note: FedEx Freight rates only appear on the checkout page, as they require a recipient’s CITY. Special Freight Note: Per Freight guidelines the Freight account number is different than the standard account number. You can find this under the LTL Freight Accounts option in the Databases drop down menu in your FedEx account screen. Method Title – Name the shipping method. This is visible to customers. Origin Postcode – Post/zip code from where you ship. Sent to the FedEx API. Method Availability – Leave set to All Countries to make it available for all customers; or select only the countries for which you want to get quotes. Rates and Services – Control the services and rates you offer customers. Residential – Enables the residential flag. If your account has Address Validation enabled, this will be turned off/on automatically. Insurance – Tick the box to get rates and insurance. Untick if using Smart Post. FedEx One – Choose whether to enable FedEx One (flat) rates. More info at: FedEx One. Request Type – Choose Account (get rates for your account) or List (get standard FedEx rates). Fedex SmartPost Hub – If using Smart Post, define your ID. Ensure that ‘Enable Insurance’ in unticked. Offer Rates – Choose to return all rates (allowing user to select) or return a single rate anonymously. Services – Here you can rename and change the order of FedEx shipping rates, enable methods you wish to offer, and add price adjustments. More below. There are two packing methods with FedEx, and each affects the parcels you send to the API. Each item in your cart (non-virtual) will be sent to the FedEx API. Quotes for all items will be combined to calculate final cost. Items will be packed into pre-defined boxes and sent to the API. We recommend this option. See Box Packing below for more information. If you choose “Pack into boxes” as a parcel packing method, the area to set up box sizes will appear. The box packer included with this shipping method lets you group items into packages for which you define height, width, length, weight and max-weight. The packing is mainly volume based, but also considers item size. The box packer is volume based. This will provide good results in most cases, but will never be as accurate as a real person packing a box (see BIN Packing Problem). Therefore, it’s important to understand that packing results are as accurate as possible, and any anomalies should be accepted. Under Parcel Packing Method, select ‘Recommended: Pack into boxes with weight and dimensions’ to set up the boxes specifications. Select ‘Add box’ to add your own. Dimensions are used for parcel dimensions and passed to the API, and are also used for packing. Box weight is the weight of the box itself and added to the weight of contents. Max weight is the maximum weight your box can hold. This includes the weight of contents and the box. Enabled can be turned on and off, depending on whether you want to use the box. You’ll notice that boxes are pre-filled with FedEx standard boxes. You can disable if you want custom box sizes. You may also add a positive or negative price adjustment (by amount $ or percentage %) to any method using the price adjustment columns (as seen above). For example, if you want to discount the ground shipping method by 10%, you would add -10 to the Price Adjustment % column for the ground option. Finds boxes that fit items being packed (uses H x W x D). Packs all items into boxes (using volume). Packs unpackable items alone, using item dimensions. To add handling fees to shipping calculations, you can use a Price Adjustment column in the Services section. Each FedEx service can be increased separately using the price adjustment columns in the row. Use the Price Adjustment ($) column to add a flat amount to the shipping quote. Use the Price Adjustment (%) to increase the shipping quote by a percentage. 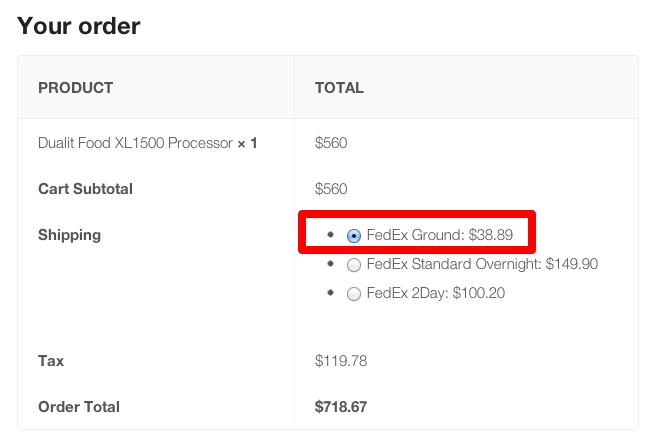 In this example, the 3-Day Select and Ground shipping methods will be increased by 1% of the quote returned from FedEx. Rates can be selected by customers. Enable debug mode to see debugging info on the cart page. This often reveals the problem. Check that products have sizes and weights set. Without this, the calculation cannot be performed. Go to: WooCommerce > Settings > General and check your store’s base country is the United States or Canada and the currency is set to US Dollars or Canadian Dollars, respectively. Confirm that the plugin is linked to FedEx API. It uses SoapClient. Need a FedEx account and meter number that supports SmartPost. Your package or item needs to weigh greater than 1 lb. Otherwise, the rate is invalid. FedEx has developed an LTL Freight Classification tool that can guide you through a quick two step process to obtain the best option for you. You can get this error if the Province codes is not abbreviated correctly in the Address section. Make sure that your account number is matching from the LTL Freight Accounts area, and that you have the correct abbreviation for your Country (US, CA). According to FedEx Guidelines Freight does not show until the total weight of the order exceeds 150 lbs. You will not be able to get the FedEx Ground Shipping Rates with the FedEx One Rate enabled, as FedEx One Rate does not support ground shipments. So make sure the FedEx One Rate option is disabled. FedEx Ground is available when shipping from the US to Canada, and Fedex Ground International is not.